Busy times with weekend rain forecast. Hi all, Rain has been forecast for the Taupo region and most of New Zealand over the next few days and should start tonight which I should think will be encouraging some fresh runs in all the rivers. As you would haveÂ heardfrom other reports the Waytahnuie has had some good fish in it but they seem to be moving fairly quickly and getting high quick. I personally have seen some of the best fish I have ever seen in this river with some solid rainbows and huge browns occupying upper pools. The westerly wind which has been battering the river mouth over the past week has definitely helped alot of fish over the lip and into the river giving many locals and theÂ odd tourist some great fishing. Fish condition in this river has always been pretty good but as you can see from previous posts these fish are in awesome condition and have plenty of energy to ensure you get a fight worth having. Eating qualities of these trout is also great with lovely orange flesh which smokes up just sweetly. With the date of the battle of the river less than a month away all I can do is hope like hell that these buggers have spawned and returned to the lake before Shane French gets his hands on them. Another river which has fished well this week with the overcast blustery conditions is the Hine. I personally have not been inÂ here but many reports indicate this river has had some fantastic pods of trout going through spurred on by recreational releases from the dam and the westerly wind. The releasing of fresh water from the dam above obviously being enough to fool the trout into thinking it isÂ a fresh and along with the westerly wind itÂ has set up perfect conditions almost. With only the lower river open currently it pays to try and get to the river as early as you can and get through the pools as every time I drive clients past at 8am the car park is usually full with the second shift of cars. Dave Cade gaveÂ me a call at 5.50am on Thursday morning and let me know that there were 5 cars already in the car park waiting for it to become light so they could start nymphing, Dave already had one on the bank using a wet line. That is too keen in most peoples books but it obviously pays to get in first on this particular river if you want first bite at a pool. 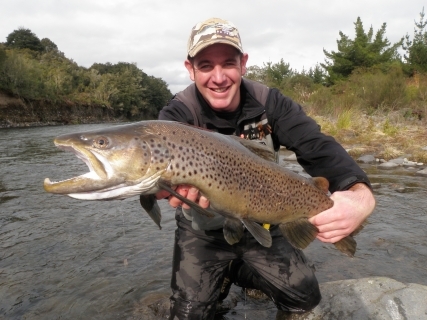 The Tongariro has plenty of fish in it but after last weeks trophy I have not got alot to report as I have not caught nor seen any fish that has come close to the beauty or size of that brownie. I have been able to have a fairly good look about and managed to see a few fish in most pools but they still seem hard to catch for some reason. The boys under the bridge still seem to be pulling the odd fish out but I have not hadÂ a chuck there this week as the amount of guys is just amazing. 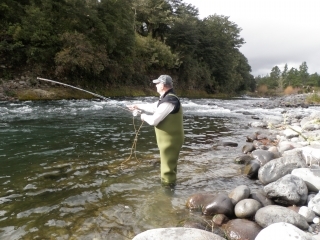 Angling pressure on Taupo rivers at the moment is crazy and especially on the Tongariro, so lets hope we all remember our angling manners and get along over the weekend. There are many good reasons for me to keep guiding but one of the most important ones to meÂ is the peopleÂ I meet on and off the river. Today I guided Gregor which lives in Hamilton but is from Switzerland and is 76 years old. Gregor first fished the Tongariro when he was my age( 27 ) and has not fished it since so it wasÂ nice to meet suchÂ a well travelled man and spend time with someone with so much to say. At 76 Gregor has slowed down a wee bit and he made it quite clear the day was about being out and about and not stuck inside watching TV but he did not want a broken leg by the end of it. I decided we best leave the Stag crossing out for another life time and stick to pools we could get to by the car fairly easily. It’s amazing what you take for granted like jumping over rocks and crossing rivers without thinking about it but as you get older it is being made obvious to me that things are not so easy to do anymore. It was a really nice morning to be out and about with plenty of birds and wildlife to enjoy while we fished the best water I could find close to the car. Stories were rolling out thick and fast and it was obvious this old boy had had quite a life and travelled the world, it’s funny where you end up eh!. I hoped like hell he would catch a trout just so he could tick it of the list but knowing his energy was fading and casting arm drooping I thought the trout may just win on this outing. As a last resort and easy pool for Gregor to fish I thought he might be able to wetline the Blue pool fairly easily as it is quite deep on the true left and with a sink tip line can fish quite well if no one had already flogged it to death. A quick cuppa was enjoyed at the car park and then straight over to the head of the pool with a great big dirty brown (brian topp) Wolly bugger. Gregor seemed to adapt quite well to the wetline and it was not long before he had the swing happening quite well and moving step by step down the pool until “bang” he had his first trout tail walking across the white water. The fish came out of no where and I thought I may just have to jump start old Gregor as I thought he had just died of shock on me but with a bit of coaching and advice he played the fish well and I was able to slip the net underneath and secure the deal. It is smiles like these which I live for and keep enthusiastic for as they are absolutely priceless, Gregor will be talking about and showing pictures to friends for a long time now just because of one fish!! 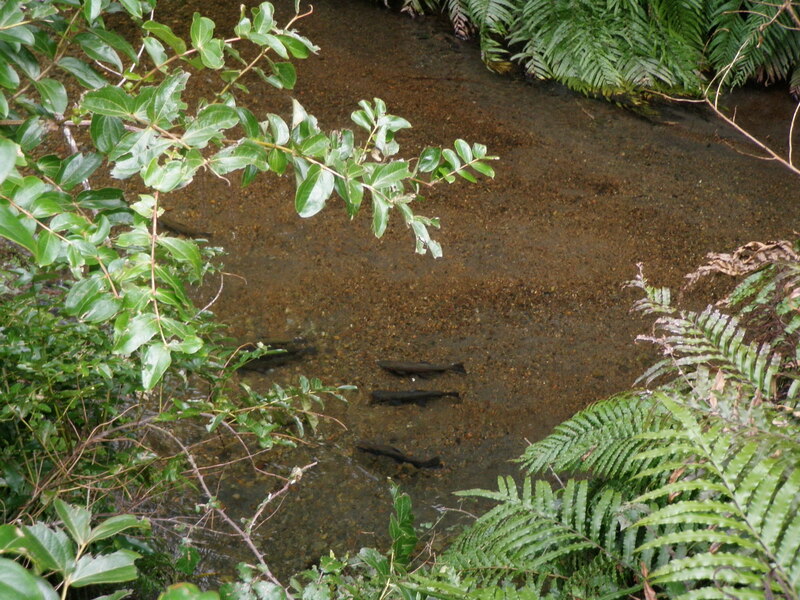 The most fish I saw in the Tongariro was actually in the spawning stream behind the trout centre just up from the trap. It is great to sit and watch these guys in action and watch how trout actually react with others, espicailly big jacks. I try and gauge how many fish are in the river by seeing how many are in this spawning stream. If they are in here they must be in most pools so itsÂ just time and patience until you find fish. I am guiding the Tongariro this weekend but may change plans due to the river being so busy with anglers from all about New Zealand. If you are about you will run into members of the Brown Trout Fishing Club which are in a small fishing comp between themselves on the Tongariro looking for the largest fish. These guys usually work in pairs and will move around pretty quickly I should think. Hope for plenty of rain! !